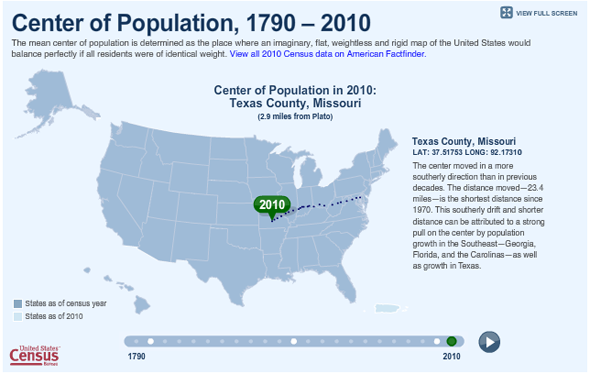 Since the first U.S. census was taken in 1790, the population center of the United States has gradually progressed westward from Maryland to Missouri. The 2010 center of population is approximately 23 miles southwest of the 2000 center of population, near Edgar Springs, in Phelps County. In 1990, it was near Steelville, and in 1980, the Center of Population was near De Soto. The State's Mean Center of Population moved less than four miles west of the 2000 location in 2010.